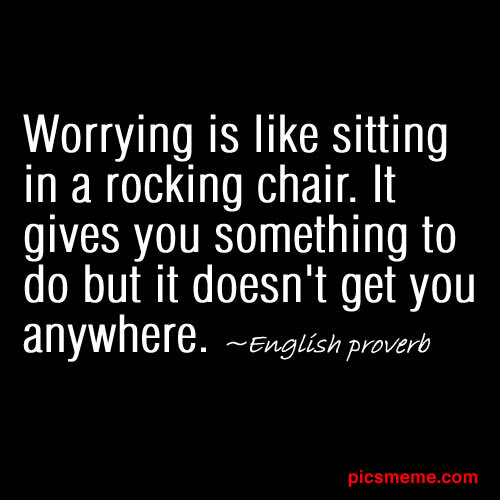 Worry is a problem that seems to be rampant. Perhaps it is due to the nature of our overly advanced civilization; perhaps it is a measure of our own spiritual degneracy. Whatever the source, it is clear that worry is not useful. It is a cancer of the emotions-concern gone compulsive. It eats away at the body and the mind. It does no good to say, “Don’t think about it.” You’ll only worry more. It is far better to keep walking your path, changing what you can. The rest must be dissolved in compassion. In this world of infants with immune deficiencies, racial injustice, economic imbalance, personal violence, and international conflict, it is impossible to address everyone’s concerns. Taking care of yourself and doing something good for those whom you meet is enough. That is compassion, and we must exercise it even in the face of the overwhelming odds. Whenever you meet a problem, help it if is in your power to do so. After you have acted, withdraw and be unconcerned about it. Walk on without ever mentioning it to anybody. There there is no worry, because there has been action. This entry was posted in Deng Ming-Dao, Holiday Happiness and tagged Christmas, deng ming-dao, happiness, holidays, mood, quotes, taoism, wisdom, worry. Bookmark the permalink.